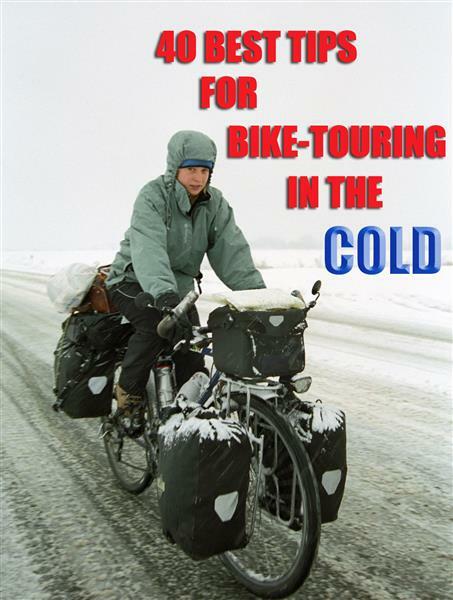 Biking and camping in the cold can even offer some advantages. 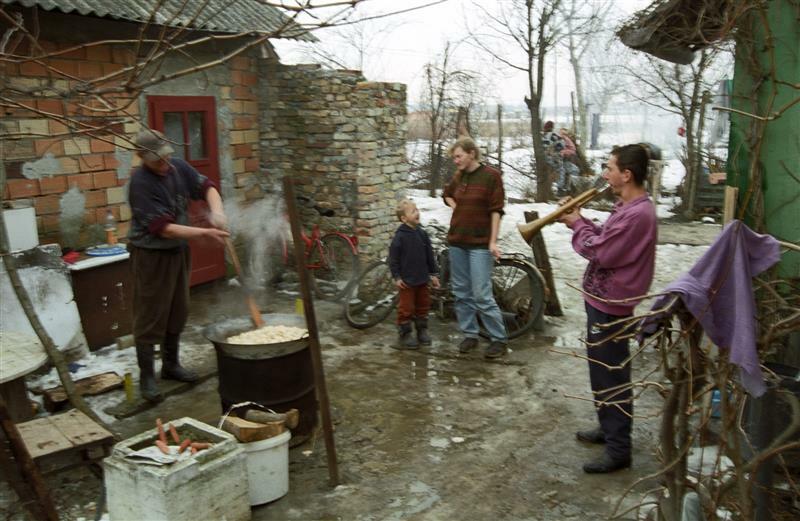 When my wife and I crossed central and eastern Europe during the winter, we spent so much time with locals who ask us in out of the cold. Most of the truly wonderful encounters that we had with local people came about during the wintertime, and gave us some of our best memories. Traveling really takes on a special meaning when you are having a rough time of it and people help you out. Cold weather brings people together. Making new friends in Serbia. Layering. When it comes to clothing and exercising in the winter, the key is layering. First, you need an insulation layer (Merino wool from Icebreaker is great). On top of that you should have a micro-fleece layer, then a fleece layer, and finally a Gore-Tex jacket. You will wear all of these layers at once only at nighttime around camp, but the layers allow you to peel them off as you need.� Gore-Tex jackets and pants from Marmot offers outstanding quality at a very affordable price. Layering, from top to bottom! The same rule applies for pants. Use an insulation layer under a Gore-Tex layer. Gore-Tex Paclite. For the Gore-Tex, I recommend Paclite because it is very lightweight and extremely compact and can be used year-round. Don’t shop in the classic winter/ski section; you’ll end up with an apparel that is way too heavy Layering is the key! Gore-Tex hiking shoes. You’ll need a good pair of hiking shoes. The mid ankle model is sufficient and preferably with a Gore-Tex layer to keep your feet dry. Feet are the most painful area of your body when cycling in sub-freezing temperatures due to the fact that your feet are not exercising, plus they are in constant movement into the wind. Always choose a pair of hiking shoes that is slightly too large – the main reason is that you’ll need extra room when your feet swell while hiking, and while cycle-touring, you’ll be able to wear an extra pair of socks. Expensive socks! Don’t be shy on spending the extra bucks on your socks. You’ll need quality over quantity. Never wear too many layers of socks. First, it reduces the blood circulation, which brings warmth to your feet. Second, compressing any type of fabric reduces its insulation ability. Bike-touring gloves. The next painful area is going to be your hands. In sub-freezing temperatures you will need a heavy pair of Gore-Tex gloves. I also carry a pair of glove liners to wear inside of the Gore-Tex gloves when it is very cold or just by themselves if it is warm enough. Bicycle touring gloves have the advantage of giving you a good grip on the handlebar and usually have some padding at the palm of the hands. Hand/Feet warmers. Nowadays, hand and feet warmers are very efficient. You won’t regret adding them to your budget. They are activated by contact with oxygen so make sure to store them where the wrapping won’t get punctured (ie. in between your clothing). Eat a lot of carbs and fat. This is the best fuel for your body to generate heat. No DUI! Alcohol only gives a false sense of warmth. In fact, alcohol is a vasodilator; in other words, it expands your vessels, which increases the exchanging surface area, thus allowing heat to escape and bringing down the temperature of your blood. Don’t hit the road wearing all of your nighttime layers – you’ll have to stop in a couple of miles because you’re too hot and sweaty. Buff scarves are great because they can be used in many different ways: around your neck during the day or in the evening, around your head when you sleep, or as a face mask when riding, etc. The fabric is lightweight and comfortable, and it breathes very well, so it keeps you nice and toasty (Buff makes some warmer models, but I like the original because it can be used year round – I even used it in the desert as protection against sunburn and sandstorms). Link: 9 different ways to wear a Buff scarf. Warm-up stops. While buying groceries, warm your gloves on top of the store heater. Take short breaks so your body doesn’t have time to cool off too much, plus frequent snacks are more efficient. Pitzip. Choose a Gore-Tex jacket with a pitzip (a zip along the armpit). This is a great feature that allows you to vent heat and sweat while riding. Marmot Minimalist Jacket is an excellent and affordable jacket. Layering pronto. Once you stop riding, add more insulation layers right away – don’t wait to be cold, your body will have to burn less calories to keep you warm. Tie loops of cord on your zippers so you can open and close them with your gloves on. Black ice. Be aware of the very slippery patches of black ice on the road (black ice – wikipedia). Don’t use your front brake on ice or snow. Tires. Choose appropriate (off-road) tires. Schwalbe simply offers some of the best tires for cyclo-touring, including in winter conditions. Exercise before bedtime. Consider doing 5 min. of exercise before going to bed so your body will produce a lot of heat right when you get in your sleeping bag. 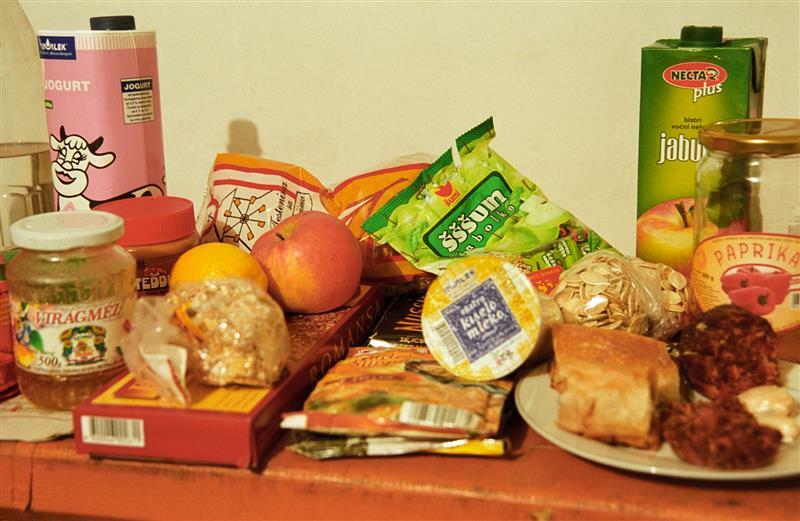 Snack before bedtime so your body has enough fuel to produce heat. Great R-value pad.� It is even more important to be insulated from the ground than from the air. I would suggest taking a 1.5 to 2-inch thick pad. The thicker your pad is, the greatest the R-value is, the most insulation you get from the ground. My personal preference for a high quality, warm pad goes to the Vaude Tour. It seems to be less subject to delamination, and I prefer the classic rectangular shape than the tapered shape from other brand (more room for the feet, and easier to strap to another pad for couples). Sleeping bag temperature rating. Check what temperature you will be exposed to and choose a sleeping bag with a rating at least 5oC below it, 10oC if you are a woman (no offense but ladies tend to be colder than men) or if there will be an important wind factor. The most reliable rating system is by far the EN testing done in Europe. More and more reputable US brands use this standardized rating system (ie. Marmot). For more info see: What is EN Testing? Our recommended sleeping bag for the wintertime is the very popular� Marmot Never Summer. Marmot uses some of the best down in the market and this bag is extremely efficient, has an excellent compact size, is affordable, and EN tested. Sleeping bag, 2 options. Either a very warm bag and an additional light liner or a lighter sleeping bag and a heavier liner. Couples. Be aware that there are not many “twinable” sleeping bag with a very low temperature rating. It will be difficult to find anything under -18oC (0oF). However if it is very cold it will be more efficient that each of you sleep in their own sleeping bag as it will reduce the empty space inside the sleeping bag. Stuff the bottom of your sleeping bag with warm fabric (fleece, damart, wool – not cotton) in order to fill the empty space so your body heats the inside of your sleeping bag more efficiently. Don’t overdo it; you could end up compressing the filling material of your sleeping bag. Filling material needs to be expanded as much as possible to be efficient. Never wear cotton in your sleeping bag; it traps the heat generated from your body and cotton takes a long time to dry. Always sleep with the least number of layers possible (just your underwear is ideal) and if it is too cold, wear thin insulation layers (ie. Merino wool, or micro-fleece), and add a fleece layer on top of that if needed. “If your feet are cold, put on a hat.” Wear a Buff scarf around your head or even as a facemask. Don’t breathe inside of your sleeping bag. The warmth feels nice at first, but your breath will dampen the filling material, which will drastically reduce the insulation performance. Synthetic bag may be better. Note that, once they are damp, synthetic sleeping bags perform better than down sleeping bags. No emergency blanket. Don’t wrap your bag in a non-breathing material (ie. emergency blanket). Everything will get very wet very quickly, making you even colder. Use the warm water from the noodle. Once your noodles are cooked, pour the warm water in a water bottle (aluminum bottle are better, as plastic may melt) and leave it inside of your sleeping bag until bedtime. If you are planning to stay in your sleeping bag with the bottle, make sure you avoid any burn injuries: wrap the bottle in some kind of insulated fabric or foam, make sure the bottle doesn’t leak, and that it is well-sealed so that the cap won’t get loose. Sleep with your batteries. If you are running short on batteries, keep them close to you at nighttime (ideally inside of your sleeping bag). The cold discharges batteries quite rapidly. A tent from a reputable brand is crucial. A good-quality tent ensures that condensation inside of it will be minimal while it will keep some of your body’s heat. Do not take a tent with a full mesh body because your body will have a hard time to heat the space inside of the tent; if you do, make sure you take a much warmer sleeping bag. 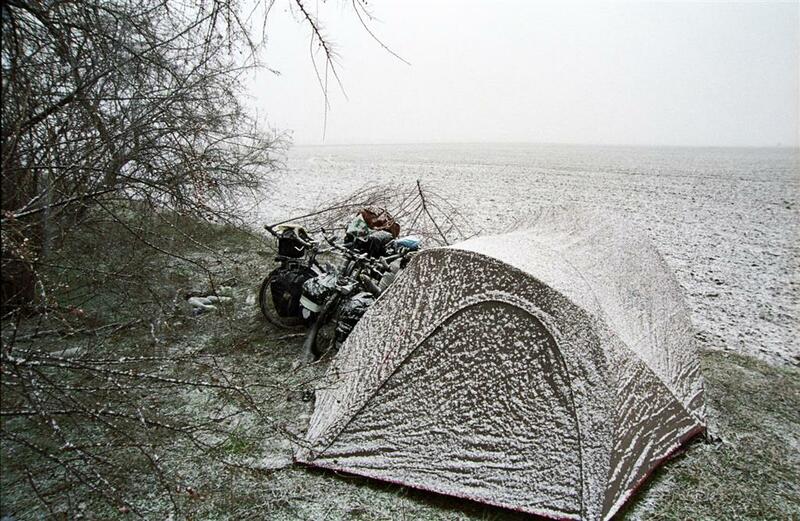 Terra Nova offers great quality tents well suited for winter bike touring. 4-season tent for heavy snow. Be careful: 3-season tents don’t handle a heavy load of snow very well (the steep roofs of the 4-season tents are better designed). Camp exposed to the East. Try to pitch your tent so it is exposed to the east so that the sun will warm you up in the morning. Dry your tent. Make sure you dry your tent and sleeping bag during the daytime as much as possible, because mildew is the worst enemy of any fabric (especially bad for the waterproof coating on synthetic fabric). Magic blanket. If possible, choose a campsite sheltered from the wind. You can hang a tarp between two trees or poles to block the wind. This� Grabber MPI space blanket is very handy in many different situations. It is the most used gear I carry in my panniers. Pack down the snow before setting up the tent on top of it; it will make sleeping more comfortable, otherwise you body will melt the snow unevenly. Butane doesn’t burn in sub-freezing temperature. Stove: Keep your gas canister in your sleeping bag – or at least in the tent – if you want to use it in the morning because most fuels don’t burn as well in sub-freezing temperatures; note that Butane doesn’t even burn at all. Gasoline burns better in cold temperature than white gas. Please refer to the section “Running your gas cartridge stove in cold temperatures” in this “Tips for Stove Users” article. One of the most popular stove among bicycle travelers is the Primus Omni-Fuel which can use any type of fuel. Water filter inside the tent. If you carry a water filter, make sure it is not sitting outside overnight while wet. Any water inside of it will damage the ceramic while freezing. Thermos. Consider carrying a thermos-type bottle to carry warm beverages, soup, etc. Keep your drink and food inside of your tent so they don’t freeze overnight. If you leave bottles outside of your tent, place them upright so that the neck is not blocked by the ice. FYI Toothpaste freezes. Same as above for your toothpaste! Warm-up socks and underwear. If you don’t want to keep your socks, underwear, or shoes inside in your sleeping bag during the night, at least put them in your sleeping bag for 20 minutes in the morning – you’ll be happy when you put them on. I wish I had found this article before heading to the Northern Tier a couple years ago. I feel dumb that I didn’t think of some of those tips by myself! I’ll print it out and keep it with me on my next winter trip! thank you cyclocamping, and keep up the great work. I don’t know that I’ll end up snow camping, although I like to be prepared with knowledge if I end up surprising myself. The tip you gave about the water filter being kept inside your warm sleeping bag was one that many people don’t know about. Your filter has some residual water inside of it and that residual water will freeze overnight in freezing temps very quickly. Ice expands and punctures the filter and/or cracks the ceramic. The filtration aspect of that unit is then permanently destroyed. Perhaps not entirely, but partially. And a few viruses or a few bacteria or cysts are all it will take to floor you with illness. They get through those damaged areas of the filter caused by expanding ice. (Keep your filter in a plastic bag to keep the residual water from escaping while inside your sleeping bag). Great article. I would add one important thing to this list: Goggles. Touring in winter in Scandinavia can be very tough and goggles will help keep the wind at bay. Even if there’s no snow, the low tempature along with high humidity can break the toughest guys and girls. Fortunately, it doesn’t mean we need to forgo cycling when the leaves have fallen. Winter cycling is an opportunity to feel every sensation more intensely. However, it’s not easy. Winter bike touring requires a certain degree of preparation and these awesome tips covered just about everything you need to know. Thanks for sharing!